Wurlitzer 88 Key Deluxe Butterfly - Art Deco "Style 1411"
Wurlitzer was a great American piano manufacturer, and extremely innovative. During the Art Deco period, Wurlitzer working with other innovators, experimented with new piano designs and many new technologies. 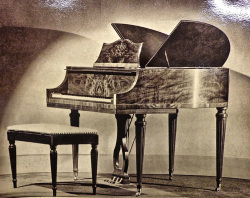 This Wurlitzer Butterfly piano, with its unique winged shaped design, is probably one of the most successful and sought after Art Deco innovations developed during this period. 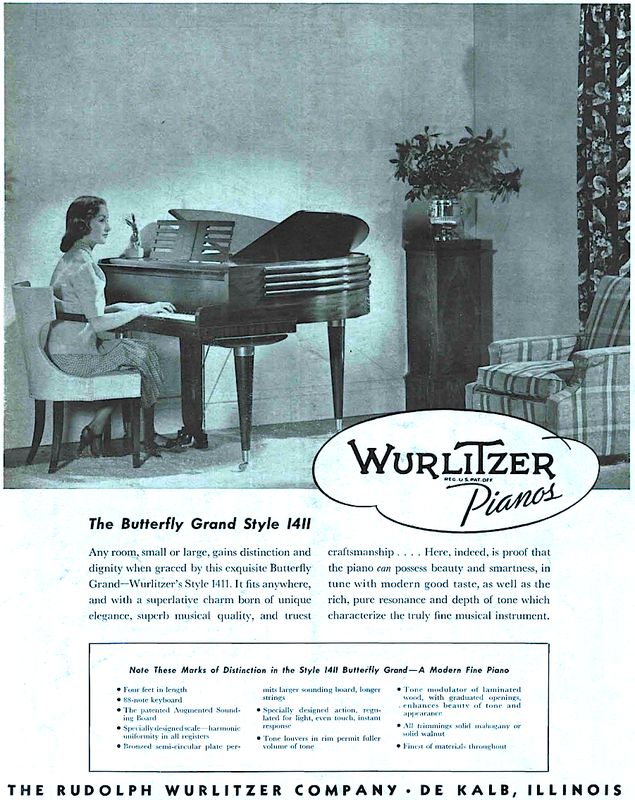 Wurlitzer introduced the "Butterfly" pianos, aptly named for the unique double winged top lid design that opened up towards the center, mimicking a butterflies wings. 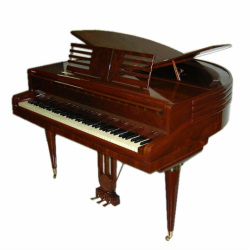 The Deluxe Butterfly Style 1411 is the only standard 88 key version of butterfly piano ever produced by Wurlitzer. Style number is finally confirmed! Some harps have a casting number such as "A-D12-39", clearly some production related number and date of manufacture or casting. ("Art Deco" or "Art Deluxe" #12, 1939) The previous suspected model is located on the underside of the pedal castings stamped 365. This stamping has been confirmed on more than one instrument. 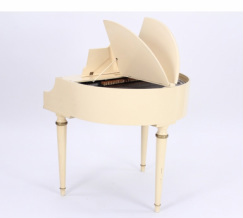 This is in line with the three-digit model number convention used for the 73 key butterfly pianos. I was previously dubbing the deluxe butterfly Model "365" until I found some conclusive evidence of the true style number. The Wurlitzer Deluxe Butterfly makes the ultimate Art Deco statement. Streamlined elements, including a quartet of raised banding around the body. These are actually sound port slots that radiate all the way around the case, and allow sound to escape the cabinet. The "winged" lids open to reveal a secondary ported removable inner lid. These lids are decoratively cut out to allow the sound to ring out via a large F hole, similar to a violin, as well as multiple radial slots along the outer edge. The design of the music desk mimics the streamline banding around the case. The design of the lyre and pedals follows the art deco detailing as well. * * * Finally, an original Wurlitzer document listing the Deluxe Butterfly! This was the back cover of the "Presto Music Times" trades magazine - Feb 1939. A big thank you to the International Arcade Museum® for their efforts documenting trade catalogs relating to the music industry. Model 230 was a simple Art Deco model, closest in looks to the 88 key Deluxe above. Wurlitzer made at least three different versions of the 73 key model butterfly. Each had variations in appointments, such as legs, lyres, and sheet music stands. All were listed as 3 feet 9 inches overall length. ​Model 235 was a Duncan Phyfe looking design, and is the only model to have four legs. 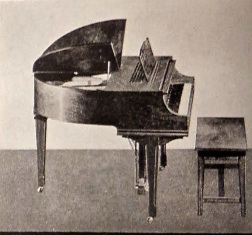 This model was also referred to as the Symmetrical Grand. This piano has 73 notes rather than 88 notes, but is otherwise a normal, conventional piano in every way. 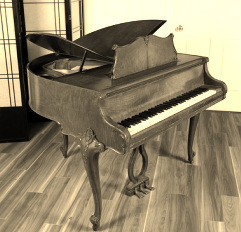 Wurlitzer built only a limited number of these little pianos during the ”˜30s and ”˜40s era. They were designed for smaller homes and apartments of the era, making them ideal for people with limited space for a baby grand. Model 236 was a Louis XV style case. 1936-39 Wurlitzer model 200 Student Butterfly Piano called the "Piccolo". This Piano is a 44 Note Keyboard model manufactured from 1936-39. Wurlitzer letters from the 80s state that this Piano was designed exclusively for teaching purposes and was sold only to Wurlitzer Dealers for Instructional purposes. Not sure how accurate this information is. These were labeled as beginners' instruments and not on par with the larger siblings.